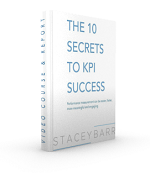 Most performance measures or KPIs will have targets. After all, we have them to focus us on improving performance. But that focus can fracture if we don’t take care in how we express our measures and our targets, so they speak the same language. We have a measure “Number of staff with excess recreation leave balance” with a target of “90% of staff with no excess leave accrued”. Can the measure and target be like this or should they speak literally the same language? This is a very common situation. I see it in at least half of the strategic plans I look over. The targets are expressed in a language that doesn’t match the measure. In Nerida’s case, the measure is focused on staff with excess recreation leave. But the target is focused on staff without excess leave. What’s more, the measure is a count but the target is a percentage. This won’t do. When people read the measure and the target, they’ll baulk at the inconsistent focus. This is distracting and confusing, and it erodes some of the credibility of measurement as a tool to inform decision making. Clean up the mess by matching the units and the direction. Nerida’s measure and target can easily be made simpler, clearer, and more credible by aligning two important features of measures and targets. The first feature is the units of measurement. Both her measure and target should be either a count, or a percentage. The second feature is the direction of improvement. Both her measure and target should focus on either staff with excess leave, or staff without excess leave. Notice how the improved measure and target combination is written, above. There is a deliberate measure name, just a few words that capture the gist of the measure. Then there is a measure description, which fleshes out the quantitative method for computing the measure. And then the target is simply expressed as a number, in units that match the measure’s quantitative method. The only thing missing in Nerida’s example, which I’d suggest you add, is a timeframe or date by which the target is to be achieved by. Or even perhaps, setting a target trajectory. Do you have some examples of measures and targets that aren’t expressed consistently? Share them on the blog, and we’ll collaborate to make them consistent and clear.